Pain and pleasure. Sometimes one leads to the other and sometimes you can’t have one without the other. I had been looking for a newer and nicer Mercedes SL, preferably a 380SL, but had other things to deal with during the last few weeks of my Father’s life and after he died. I ended up going through several disappointments and frustrating situations that, in the end, led me to the 1985 version of perfection. In addition to how I got it, I have a lot of pictures of this car. In some you can see my white 1973 450SL in the background. Here is the link to the pictures. One day when I went to see the lawyer who was handling Dad’s will, I noticed a gas station that had been on the corner of two busy streets for years must have closed. The lot was covered with European cars of varying years. I drove in, barely able to find a parking space, and told the manager I was interested in the Mercedes W107 SLs (W107 is the specific body style designation). He had two on the lot and I looked them over. The gold one had some rust and other issues I could see. The white one looked like it was in good shape and almost no rust. It looked to be in great shape. He said he was waiting until Spring to work on them, since they’d sell better then and he had higher profit vehicles to finish up before they were done. I gave him my card and told him I was interested. This was at the end of December. Fast forward to late February. I had talked to him a few times, but he wasn’t in a hurry. Then a tree, from my neighbor’s yard, fell on my truck and part of my garage. 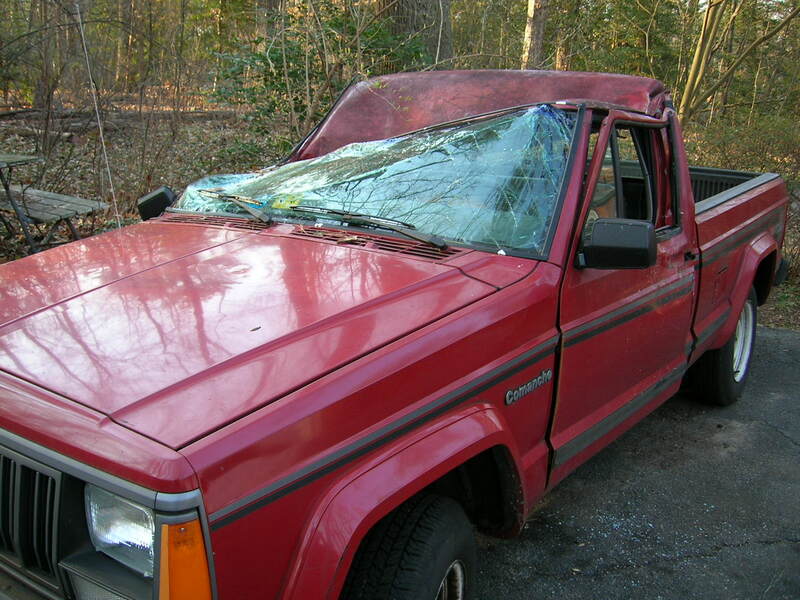 It missed the 1973 450SL, but crushed the cab and ruined my pickup, a 1988 Jeep Comanche known around here as Ol’ Faithful. (Yes, around here, cars tend to pick up names. The truck was also called “Brunhilde”, after the lead Valkyrie because that truck could face anything. 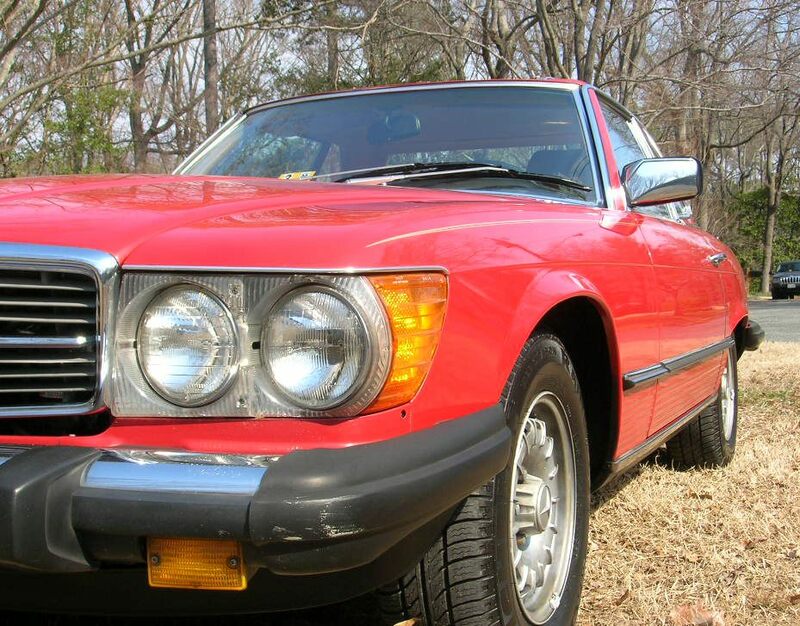 The 1973 450SL is “Sweet Baby.”) I decided I needed a reliable car, but didn’t want to get a new one because I’m still up in the air about which new car I’d want. I needed a reliable used car and went back to talk to the dealer about his 1984 380SL, a white one seemingly in good shape. It’s not Spring, he didn’t want to tackle it. I asked if he’d be interested in selling it as is. KA-CHING! You could almost see dollar signs in his eyes. He arranged a test drive the next day. The test drive was not what I call a test drive. I get in the car, with him beside me, and he tells me where to go and keeps talking all the time. The blower fan starts making noise, or so I think, and snap, he’s pressed a button to cut it off. He has told me it “runs a little rich.” Uh hunh. When a mechanic says, “…a little…” and isn’t specific, then I start to worry — especially if he’s trying to sell me the car that is “…a little –” –, well, a little whatever. He controlled the test drive and it was nothing but right turns. I don’t even know if the left turn signals worked on that car. I said I’d like to take it to my mechanic for an inspection. He almost throws a fit when I mention the name of my mechanic. “He’ll tear it apart. This is a 1984. A car that old isn’t perfect and he expects them to be perfect.” I didn’t tell him that my mechanic has a 380SL from the same time that is in such good shape that it could go for $25,000. Yes, my guy knows classics. He knows them better than most mechanics ever will. My guy, or rather one of his mechanics looks over that white 1984 380SL. When the Service Manager called me, I could tell in less than a sentence the news was not good. Yes, the car looked in great shape. No. Hardly any rust at all — except. Except what? Rust is one of the biggest killers of classic cars. There is rust in the fill tube to the gas tank. That means rust in the gas, in the filters, possibly in the injection system. There is sludge in the engine. The injection system needs serious work. I could pay an extra $5,000 in the first month just to make sure the car runs and is safe. In the meanwhile, I had run a Carfax report and found the car was on this dealer’s lot for 2 years. Now I know why. He knew how much it would cost and knew he wouldn’t make anything on it. The inspection cost me $77 and change. It saved me thousands of dollars. Wise investment? I’d say so. Gee, now I wonder why the dealer reacted so strongly when I told him who would inspect the car. If you’re keeping score, I’ve lost Ol’ Faithful and found that what looked like a good deal was a money pit on wheels. So what good can happen? I find out the bad news on Thursday afternoon, this past Thursday, actually. Once I heard, I started searching. There was one that looked good in Stafford, about 90 minutes north. 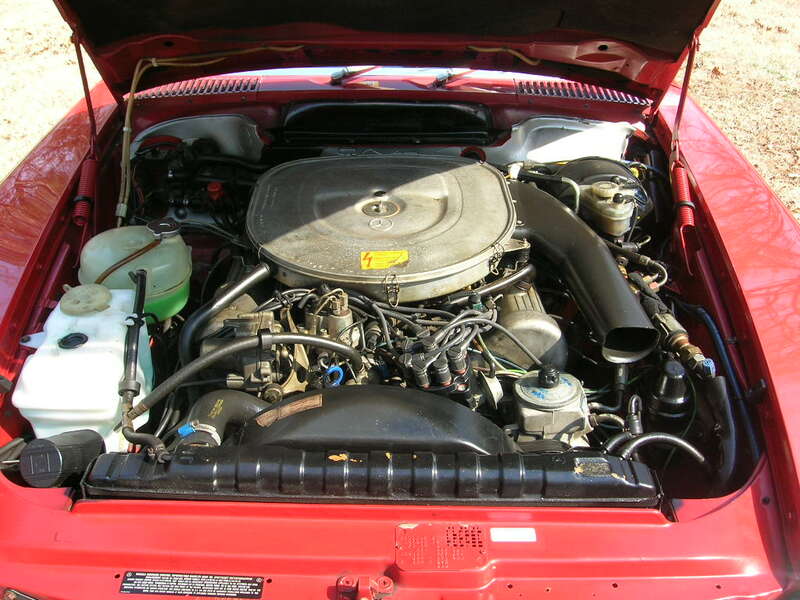 It was a 1983, which was before Mercedes fixed a timing chain issue and that could be a concern, but one I could deal with. The price was also over $8,000. I could deal with that, but in terms of market value, I was concerned. I called and checked on it and ran a Carfax report. I start making plans to go up there the next day to check on it. Carfax has inspectors, too, so I can even get one to go there and inspect the car, since it’s too far away to have my guy check on it. 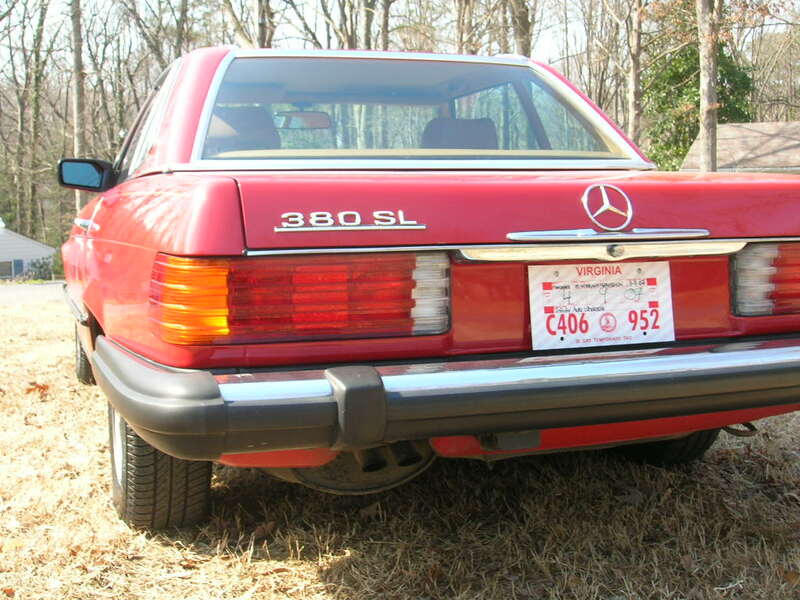 Then, that evening, I find another listing through Carfax: It’s a 1985 380SL and in Ashland, about 10 miles north of Richmond and less than half an hour from me. No pics or stats, though. Oh, and the car had only been listed for 3 days. The next morning I start calling and at 11:00 am I reach the company. They refer me to someone who isn’t in yet, but can be reached by cell. He’s going to put it on eBay, but I can test drive it. While driving up to Ashland I make calls to find who I can get to do a pre-purchase inspection if it’s in good shape. I get up there and see the car in the garage. My jaw drops. It’s in great shape, or at least looks it. I ask if I can test drive it. Sure, they say. They don’t even get my driver’s license. They have my other car and my phone number from earlier. The only problem is it needs a boost to start it because the battery is old. I get to go out alone, put it through it’s paces, and notice I can barely hear the engine at 45 mph. It’s a 22 year old car but it looks almost new. Even the engine is clean. I get back and they say I can get it inspected. The nearest place is the Mercedes dealer 15 miles away. No problem. For this long an outing, they want my ID info and such. I give it to them, drive to Mercedes, get them to look at it, walk to lunch, walk back, read a National Geographic, and get called. The mechanic starts by telling me it’s missing 2 bolts on the transmission mount. It’ll run okay, but I need to get 2 bolts and screw them in. Oh, and there’s a small fuel leak, so replace some crush rings near the tank (crush rings are like washers). At this point I’m breathing a sigh of relief. I ask, “Is there any bombshell you’re warming me up to?” No. No bombshell. The antenna doesn’t go to full length when raised. 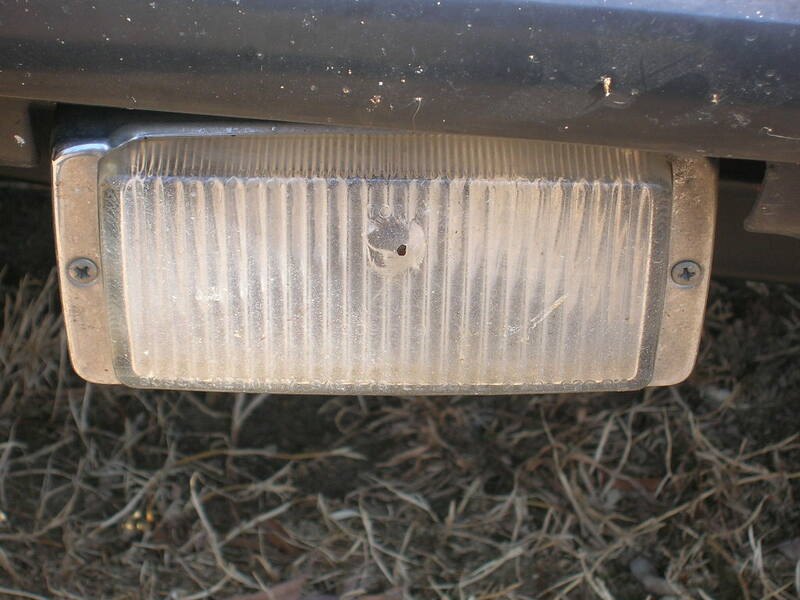 There’s a chip in one fog light lens and a small, and I do mean small, spot of possible rust that I can easily get fixed. A few other issues as well, but I’ll talk about those later, when I talk about the work I do and have done to it. How impressed was the mechanic with the car? After it was done, I was talking with someone before leaving and noticed people would come out from the Service dept. or other sections and look the car over and go back to work. People were talking about that car and they wanted to see it and tell others about it. Yep. The Mercedes people were impressed. I call the dealer back and say, “There’s only one thing I more I’d like from you.” He asks what and I say, “A fair price.” They give me one. I could have dickered. On the other hand, this was thousands less than the black one in Stafford that I had yet to see and this car could possibly go for $10,000 or more. I take the price. I don’t even dicker. It was more than fair. I pick up a cashier’s check on the way back. At the shop the woman helping me with the paperwork goes with me to drop it off for inspection. It’s 4:45 pm by now. The only suspense is if this shop will get it done by 5:00 when they leave. We go back, do the paper work, and get a call from the shop. It’s ready. She drives me up, we get MY car. Yes. MY car. My 1985 380SL in prime shape, complete with AM/FM/Cassette/10 CD changer. I drive back to the shop, get everything I want (like CDs and the garage door opener) and put it in the new car and drive home. Of course, you know there’s got to be one fly in the ointment. My 1973 450SL is still on their lot in Ashland. I find a friend who will help me drive it back. I start the new car and it won’t start. Remember they needed a battery booster to start it? In all the rush and excitement I had forgotten. So I, as a grown man, call Mom for help! She picks me up, I drive to the auto store, get a new battery, and it works perfectly. The car rides like a dream, handles well, and even smells like it’s new. I’m going to miss Ol’ Faithful and I’ll be selling the older car I had been restoring, but now I have a prime condition W107 style body. It’s what I was hoping for at the start. Sure, this has a few small things to fix. That’s part of the fun of a classic. It won’t officially be an antique until 2010, but this car will always be a classic. I’ve already found a name for this car. Or, rather, she’s found a name for herself. A name that represents a “can do” attitude for someone with strength, but especially with grace and beauty. Somehow it just fit to call this car Mrs. Peel. Oh, and it’s a lot of fun to drive! 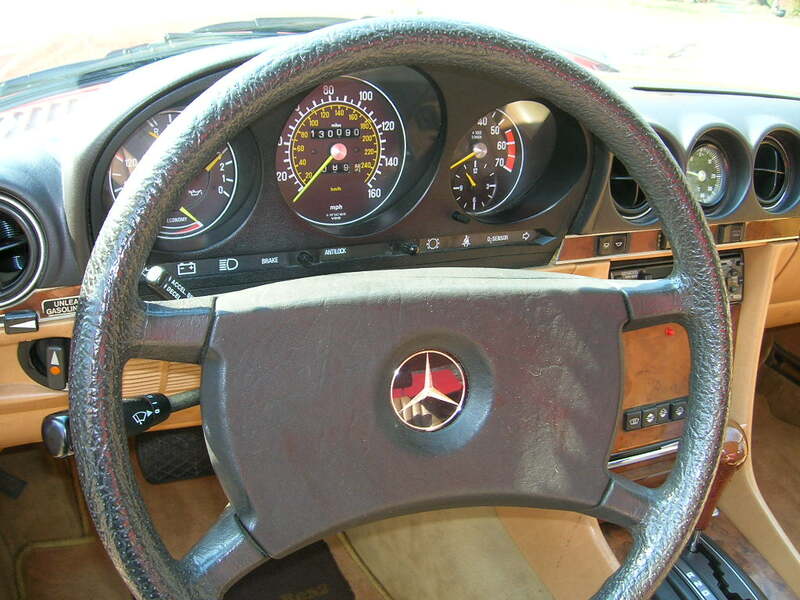 This entry was posted in 1985 Mercedes 380SL, Classic Cars. Bookmark the permalink. You are my hero, so when do I get a ride in the wonderful “new” car. 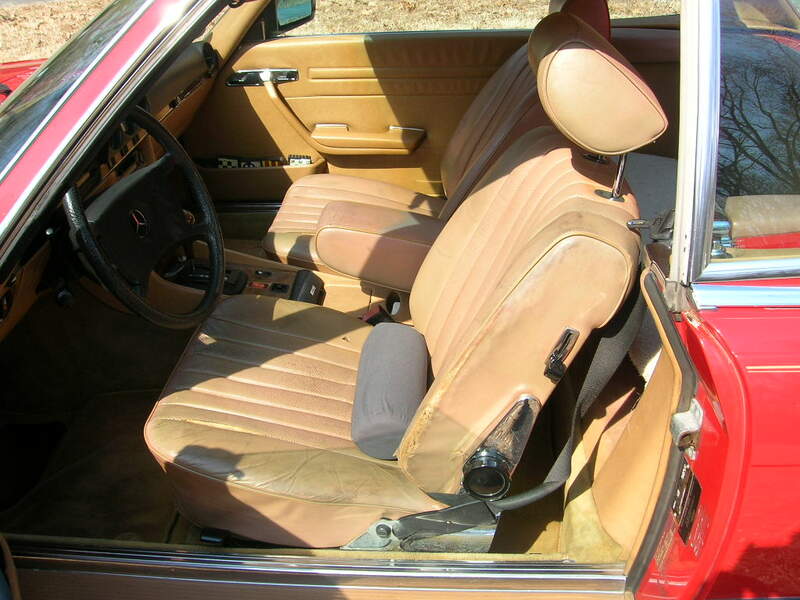 Hal, dear it’s beautiful are the seats leather or was that a stupid question because I know they are. I’m happy for you, sorry to hear about the truck but glad things worked out with the Mercedes. Read your post on the MBCA forums and went to your blog to check out the pictures. GREAT! Very nice looking car. I have a pristine ‘88560SL but would love a 450 as a daily driver. These are great cars and still turn heads when I pull in for gas (which is a lot!). Care and thanks for posting. Nice story, nice car I just read it on Benzworld forum. My story involves too many beers, ebay and a wife that said yes. My car a 1976 450sl it spent a year in the body shop and it will never be a perfect car but it runs well and I love it. I also have lots of fun working on it. My next car I’ll know what to look for. Thanks for your story. Good story, well told. Signal red is the default color for these, the best color to have. Have your Mercedes dealer run the Vehicle Master Inquiry and you can call 1-800FOR MERCEDES and request a photocopy of the original window sticker on the car if you want one, and the Mercedes Benz histrical archives in Stuttgart, will, at no charge, for a photocopy of the title, provide you with a copy (ask for one in English!) of the factory build sheet. Meanwhile run the russian free VIN Check on the car. Nice, good car. I love those Panzerwagens They are a car for the ages. BTW join Mercedesshop.com There is a very large and friendly group of Mercedes owners from the DC/VA area there, one of them is a Dealer tech. named John. They are friends of mine, and mention my name Jim B. (Kevin, Siduri, Tom, JohnHef are their names. SID owns a W126 420SEL and an 87 560SL, Tom has a 87 560SEC, and a 300D wagon, John Hef has a 500SEC and other cars. Kevin has an enormous collection of cars. I am thinking of going XC to visit all of them in DC in October in my own ’91 560SEC. Good luck with the new gem.